Fairytales and mythology were written and told for more then just entertainment. Most of the ancient stories told had a purpose; whether it was to scare children, political control, fear, or to teach a moral lesson. I think Thor is a story told about the dangers of arrogance. He is the son of the most powerful man in his realm and he himself is pretty strong, and he knows it. Enough about the morality of Thor, the point I am getting to is that this isn’t just another comic book movie that is exciting and fun, which it is, it actually has some substance. Do not misunderstand, this movie doesn’t change the world and will not be considered an epic masterpiece, because it isn’t. I just think that Kenneth Branagh made a really good and solid film, I enjoyed it. It fits perfectly into this current Marvel film universe. Thor is the story of a “god” who is cast out by his father for being to much of a hot head and breaking a truce with a race of frost giants that threatens the peace of his world. Thor comes to earth, hangs out with some humans, and has a hard time learning humility and compassion. Earth is then threatened by a powerful force and Thor and his old friends and new friends must defend earth and then save Asgard. There is a lot that I am skipping because this isn’t a synopsis. If you don’t know anything about Thor, but have seen Iron Man and want to know what is happening in that universe, go check this movie out. It is entertaining, fun, and the acting is incredible. This is a Kenneth Branagh film. 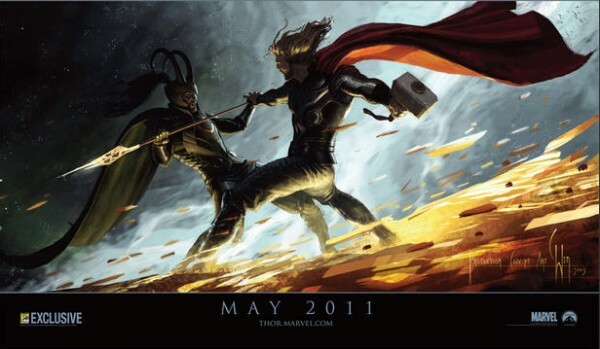 Thor stars Chris Hemsworth in the title role, Tom Hiddleston as his “brother” Loki, and Anthony Hopkins as Odin. The rest of the supporting cast includes Rene Russo, Idris Elba, and Jaimie Alexander as Asgardians. Natalie Portman, Stellan Skarsgard, and Clark Gregg make up the cast of mortals Thor encounters on earth. The one thing that Marvel is doing flawlessly right now is casting. Iron Man 1 & 2, The Incredible Hulk, Thor, CaptainAmericaall has perfect casts. This casting is what is really setting them apart from other blockbusters. When a major casting decision has been made Marvel sends the actor or actress boxes full of essential comics that involve the character that will be portrayed, this is a great thing because it gives these artists ideas on what they can do to change, improve, or mimic in these legendary characters. Good actors portraying characters that fan boys love nearly always means good money for the studio….they finally get it! I liked Thor. It wasn’t as good as X2, Spider Man 2, or Iron Man, but it was just as good as any other Marvel film and it leads nicely into both Captain America: The First Avenger and next summer’s The Avengers.